Describing input field in ArcMap Field Calculator window? 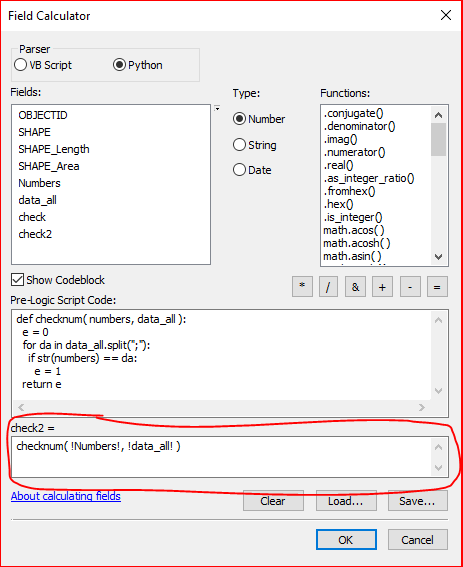 A few days ago I was answering Comparing two fields and printing result as 1 (if number matches) or 0 (if not) using Python Parser of ArcGIS Field Calculator? What is that bottom section actually called, so I can use the right term? In the tool dialog box, an expression can be entered directly into the Expression parameter, or interactively built using the Field Calculator. Not the answer you're looking for? Browse other questions tagged arcgis-desktop field-calculator python-parser terminology or ask your own question. Comparing two fields and printing result as 1 (if number matches) or 0 (if not) using Python Parser of ArcGIS Field Calculator? How calculate sequential values based on group field?